As scary and surprising as it is, I leave in 15 days. While I have a to-do list that is nearly a mile long and which is distracting me from getting excited, I have nonetheless attempted to take breaks to read my Cameroon guidebook, news websites, and look at current volunteers’ blogs and pictures to remind myself that I am indeed moving in Cameroon. While it is ever apparent, and quite frankly saddening, that many of the things I’m doing over the next two weeks are going to be my ‘lasts’ in America for 2.5 years, it has yet to sink in that the next 2.5 years will be filled with an incomprehensible amount of ‘firsts’. I guess for all that is bad it is counterbalanced by good – usually that is the case at least. In order to pump myself up for the adventure that is ahead of me, I have created a list of 3 places I want to see in each of the 10 regions of Cameroon. I’m considering it a bit of a travel itinerary and goals I have set for myself over the course of my Peace Corps service. While I know I will visit countless places that are not on my ‘top 3’ lists, at least these lists give me something tangible to hold on to in anticipation. 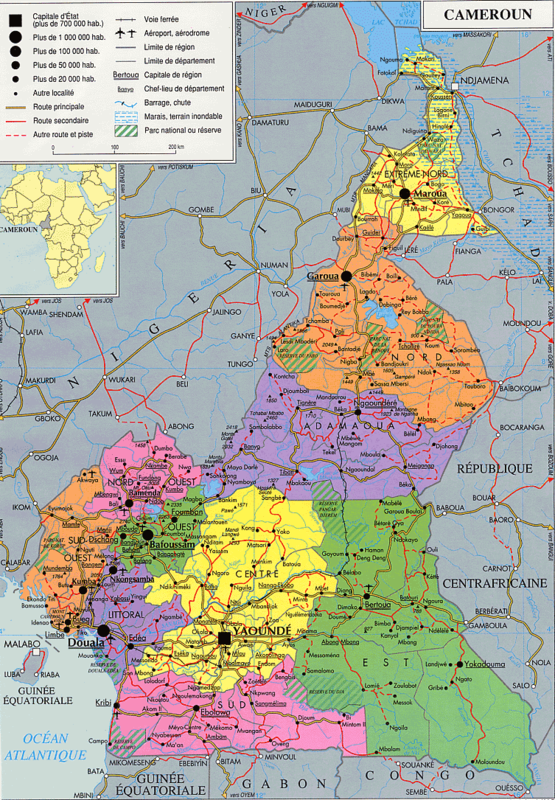 If I manage to complete these lists, not only will I have set foot in all 10 regions of Cameroon – aptly called 'Africa in Miniature' – but I will also have seen 30 different destinations dispersed across the country by my end of service. So without further ado – here is my first travel itinerary for the Littoral region (in which I have purposely left out the coastal port city of Douala because I hear from many that it's a place to be avoided. On verra). 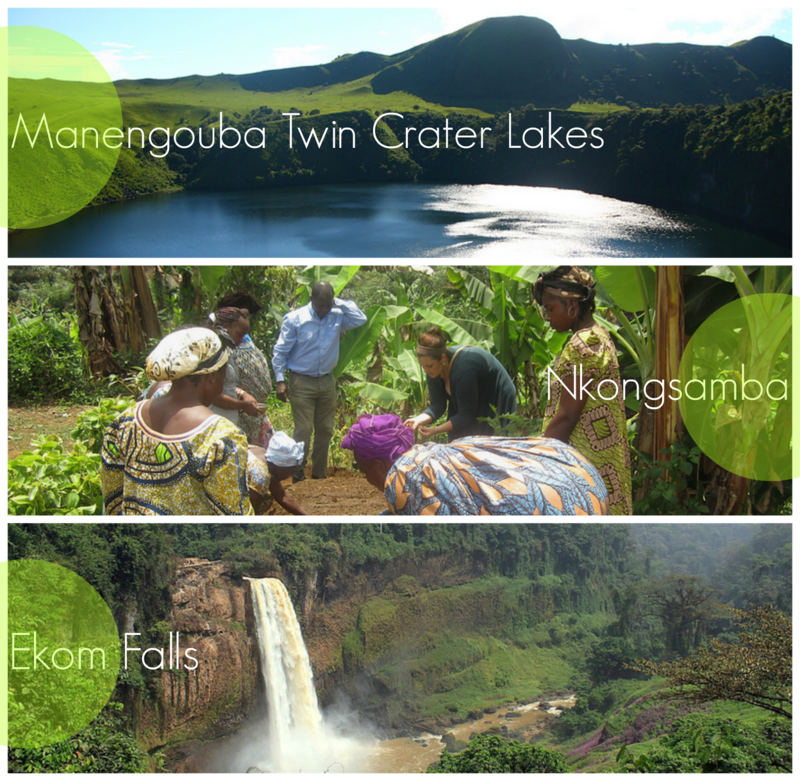 The Manengouba Twin Crate Lakes // Cameroon is home to many crater lakes, which are bodies of water that fill volcanic craters. The Mangengouba Twin Crater Lakes are located outside the town of Bangem and are situated the border of the Littoral region and the Southwest region. The crater lakes are aptly named ‘Man Lake’, which boasts a deep green color from algae, and ‘Woman Lake’, apparently a deep blue color. I hope to not only climb to the 7,910ft summit of Mount Mangengouba, but I also plan on swimming in Woman Lake, which is apparently permitted. I can’t wait to see the Adam and Eve of crater lakes! Nkongsamba // While Nkongsamba isn’t high atop my list of cities I want to see in Cameroon, mainly because it seems to be a very rainy place, it is nonetheless on my travel itinerary because it is close to Ekom Falls. Despite the rain, Nkongsamba seems like an interesting town to visit, if only for a nice view of Mount Mangegouba and as a resting base before my visit Ekom Falls. Ekom Falls // This is the main reason I even want to travel to the Littoral region. Ekom Nkam Falls were featured in the 1984 film Greystoke: The Legend of Tarzan starring Christopher Lambert. The waterfalls are 30km tall, which would make them the tallest (and the only!) waterfalls I have seen in my life.